One of the unforgettable experiences, for those who choose Alicudi as destination for their holidays, is the ascent of Filo dell’Arpa. It is about a mountain which rises up till 675m and constitutes the whole island of Alicudi. One of the best moments to face the climbing is before the dusk falls. Once reached the peak you can fully enjoy wonderful sunsets. The path leading towards the peak is not of the best; in fact it climbers up the mountain through a steep mule track made up of staircases of lava stone. It is recommended to put on suitable shoes, to bring a torch (fundamental because of total lack of illumination on the island) and a little stock of water. The climbing starts in the suburb of San Bartolo, situated at the altitude of 350m and easily reachable from the port through a long staircase. The path crosses a first part of partially uncultivated land, to go on a more tough point (because of the presence of prickly pears or reed) towards the suburb of Piano Fucile, a place where is found the evidence of a prehistoric settlement belonging to the civility of Capo Graziano, dating back to the 16th B. C. Not far away from this site it is possible to visit the Timpone delle Femmine, a natural shelter used against the raids of corsairs and pirates. 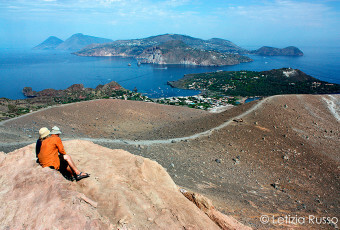 After this long walk the effort will be rewarded when, once reached the peak, you will enjoy the amazing view and wonderful sunsets, always different for lights and colours, wild nature that only Alicudi can offer.